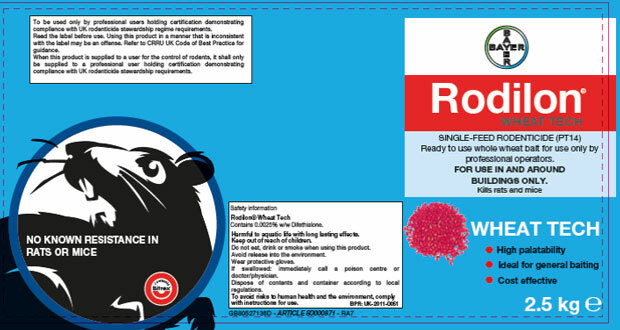 Pest controllers are being reminded that all product labels of ‘Second Generation Anti-coagulant Rodenticides’ (SGAR’s) will need to be revised this year, in line with CRRU (Campaign for Responsible Rodenticide Use). Product labels will include a new ‘stewardship phrase’ stating that it can only be applied by certified individuals, who are able to demonstrate compliance with UK rodenticide stewardship. Bayer has amended all labels for its entire range of second generation rodenticide products. Four products that make up the Bayer Rodilon range will all come to the market at the same time with this stewardship message, during July. “We know our products are essential to rodent control but we understand the need to address the wider environmental impact, in an industry led solution to responsible rodenticide use. As of 31 March 2017 it will be illegal to use old label products.